Y’all…I made one of the best things ever. AND I was challenged to do it. A food blogger friend of mine, Adam from Unorthodox Epicure and I decided to have a foodie competition. We exchanged criteria to meet and agreed on a post date. I gave him the challenge of using these three ingredients (but not limited to): tahini, seafood and bleu cheese. 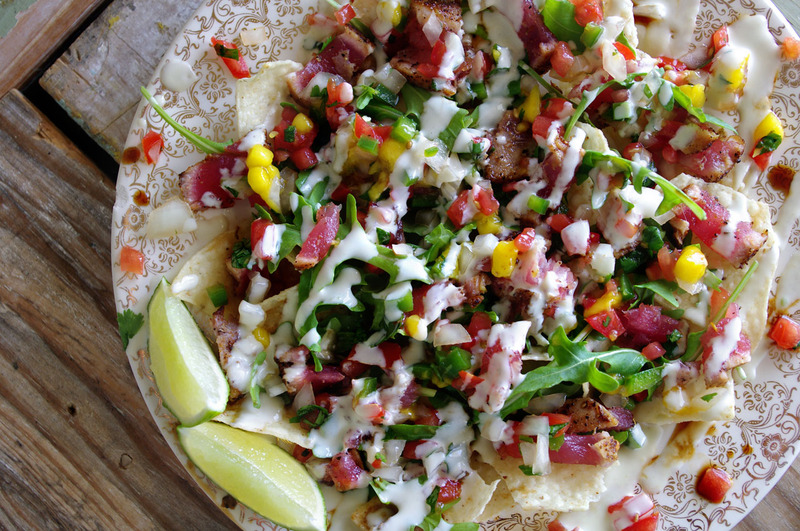 He gave me the challenge of making nachos from three regions: Texas, China and Italy. Um… somehow he thought he got the short end of the stick. I really don’t think that was necessarily the case. (He just wanted to whine). Nevertheless, I did make some badass nachos. 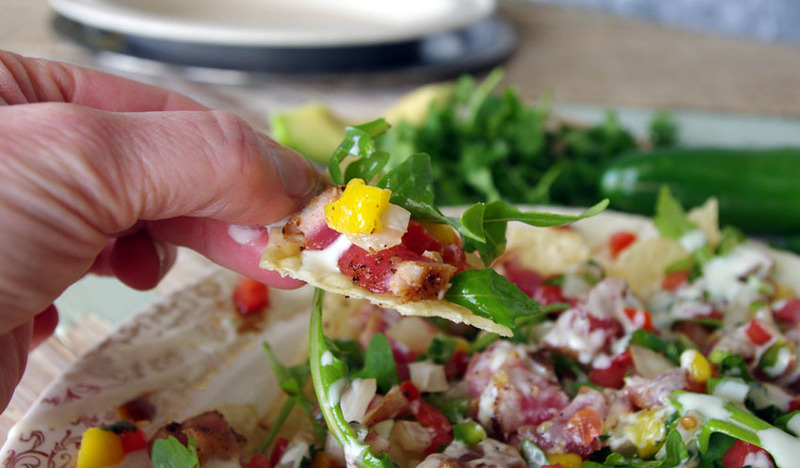 These are homemade seasoned flour tortilla chips topped with seared Ahi tuna, mango-jalapeno salsa, drizzled with avocado wasabi cream, and garnished with fresh Arugula. My husband declared them restaurant worthy. At one point I think he mentioned something about marrying them…. They’re definitely outstanding. I made them four times in the last week. Want to see what Adam made?? Go here. Spray chips with nonstick spray and generously sprinkle both sides with seasoned salt. Bake for 5-7 minutes on each side, until crispy. Combine all ingredients for avocado cream, cover and refrigerate. Combine all ingredients for salsa, cover and refrigerate. Salt and pepper tuna steaks, and bring 1 tbsp canola oil over medium low heat. Add steaks and sear 1-2 minutes for rare; remove from heat and slice. Whisk the soy sauce, sesame oil and ginger together. 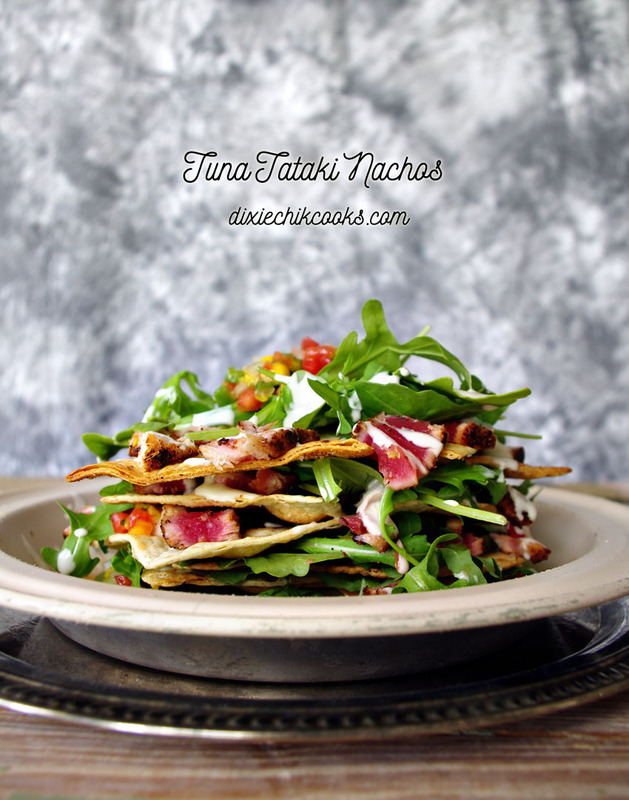 Assemble nachos by layering tuna on chips, top with salsa and avocado-wasabi cream, arugula, and drizzle with soy/sesame mixture. appetizer recipes, avocado, competition, mango, nachos, salsa, tuna, tuna takaki, wasabi. Bookmark. I think I have to call it a draw! They are both winners!